Which is that I got the first pass page proofs this morning and read the book through, front to back, for the first time since sending it in a month ago. Folks, this book is really good. Like, better than I remember it being when I sent it in. Which is not too surprising since when I sent it in it was 7am and I had been writing all night and my brain was the consistency of tapioca pudding. But even so. It really moves. And it flows really well. And your favorite characters from The Collapsing Empire are back doing some pretty cool stuff. Can’t wait for you all to read it. Uh, in October. Sorry. But it’ll be worth the wait. People with a familiarity with time travel tropes may have heard of the “grandfather paradox.” But now, author Wendy Nikel proposes a corollary for her newest, The Grandmother Paradox. As an author, I struggle with titles, and I don’t normally settle on one until a story is completely written, usually borrowing from bits of description or dialogue I’ve written within the text. Not so with The Grandmother Paradox. This title was the inspiration and starting point for this second time travel novella in the Place in Time series as I delved deeper within the world I’d created in The Continuum. A “grandfather paradox” is an event in time travel where altering elements of the past causes inconsistencies in the present. Returning from the past, a traveler may discover that things aren’t as they left them; something they’ve done has caused a ripple of change. The paradox gets its title from the most frequently cited example: A time traveler visits the past, kills their grandfather before their parent was conceived, and thus prevents their own birth. Some of my favorite time travel stories play with this trope. Think of the original Back to the Future, where Marty must help his parents get together to fix the timeline before he and his siblings fade out of existence. Or the Doctor Who “Father’s Day” episode in the Ninth Doctor’s era, where Rose rescues her father from a car accident, causing all sorts of damage to the timestream. In The Continuum, professional time traveler Elise Morley travels forward in time and has to face a situation where history seems doomed to repeat itself, but I knew that with the second book in this series, I wanted to send a character into the past and force them to confront another time travel conundrum: whether it’s possible to change the past and – if it is possible – whether they should. Thus, the title of The Grandmother Paradox felt like the perfect fit, and I built the story around that premise, though with the slight alteration that it’s not the protagonist’s ancestor who’s in danger, but the ancestor of someone important to him. So when Dr. Wells, the head of the Place in Time Travel Agency (PITTA) suspects that someone’s trying to use the concept of the grandfather paradox to eliminate the family line of our first book’s heroine in order to prevent her existence (and thus prevent the events of the previous book from taking place), he’s unable to turn to her for help. Instead, he recruits the very man whose life she saved and who thus has just as much to lose if she ceases to exist. Former secret agent Chandler, the protagonist of this novella, travels back to the year 1893, where Juliette Argent, Elise’s great-great-grandmother is working as the assistant to a traveling magician. But she’s not an easy person to protect. With her bold and fearless attitude and her fascination with time travel (of all things! ), Chandler finds it more and more difficult to keep her safe and keep his purpose there secret. 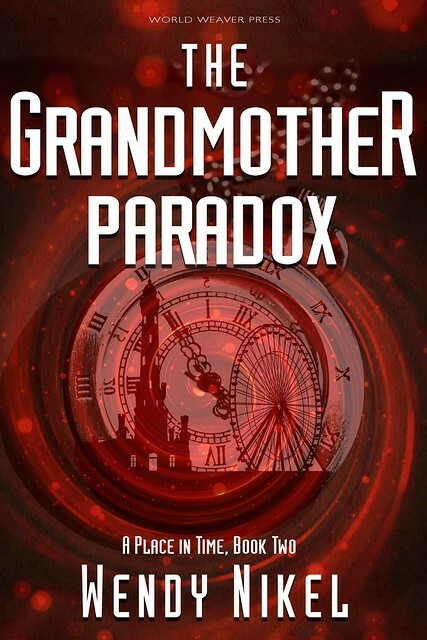 In The Grandmother Paradox, I was able to explore a fascinating time in history, more deeply examine some of my favorite characters from the first book, and even dabble in a bit of romance. But most of all, like the first book in the series, I enjoyed being able to play around with the twists and turns of time travel, the logic puzzlers and paradoxes that make this subgenre so much fun.